I got: Nothin. Which, I Think is Part of the Deal….and Okay. I set up my lap top hoping to write something meaningful, helpful……(Not so simple at this point. This currently involves: pillows stacked on my lap and books to make sure it doesn’t over heat…..) Instead, I wasted an hour goofing off on FaceBook and shopping on Zappo’s. Not buying.. just oogling. And maybe some time on Amazon too. Because the truth is: I got nothin. That’s my offering to you today. Nothin. I’m tired and hurting and recovering and not exactly overflowing with wisdom….. truthfully? I’ve been overflowing with crankiness and some whining and disappointment. Cranky cause I can’t get done what I want to get done. (Mom stuff. You know: THE DAILY LIST.) Whining cause I had planned on feeling better by now. (I totally ignored the doctors clear explanation that this surgeries recovery is slower and more difficult.I thought he was exaggerating. Or under estimating my toughness…He wasn’t.) Disappointed…..cause it’s slow. and my husbands PSA is steadily creeping up and I had really hoped that we were about to move into a season of getting better and BEING better…..
I’m praying. I’m reading. I’m talking about how it all feels. I’m knitting. I’m resting. I’m doing what I can. And nothing more. I’m present. With my kids. (Trying to take time with each of them each day.) With my husband. (I’m so blessed he loves me even when I’m a mess.) With God and myself. And yes- with the pain. I’m BEING. But, there isn’t much overflow. It kind of feels like swimming against an undertow- actually. Surprisingly- the swimming doesn’t feel like drowning. It feels more like a work out. This owning… this verse came up a few times…. 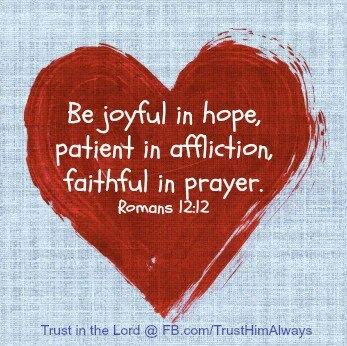 Be joyful in hope…. Patient in affliction… faithful in prayer…. I may have nothing to pour out….. But, I am joyful in hope…. hope that my body is daily in small and slow ways healing…. 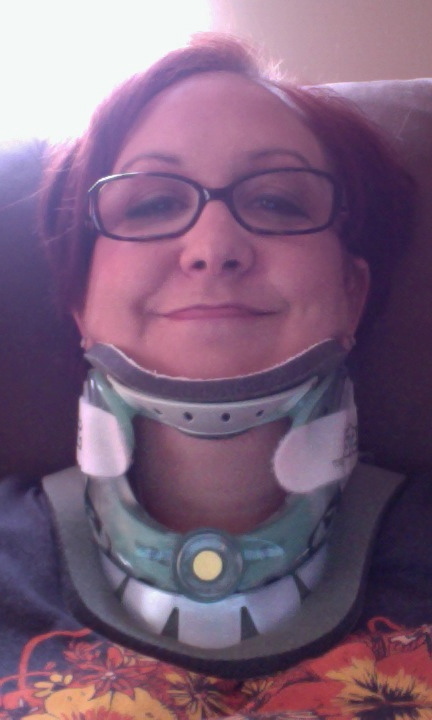 (A miracle when I think about what they actually did to my neck…. there are youtube videos of the surgery you’re welcome to google it: Posterior Cervical Fusion- C4-T1. For the Sciency- (like me) it’s interesting and amazing… for the squeamish-… don’t go there. Faithful in prayer… well… hurting and fear (over hubby’s cancer status and whether this surgery will actually work, and what exact autoimmune thing do I have going on? And what are we going to do about it?) Yeah… that .. all that… in desperation calls me to faithful prayer………so do the hours I’m spending in the chair…. reading friends updates and watching news items that I can do nothing about— except pray. That’s where I’m at. I Got nothing… and yet…. I’m Okay with that for now. I think. this is exactly where I need to be. It’s when we’re truly empty of our own power that He can refill us…. usually to over flowing. Maybe you feel the same. Like you got nothin. Maybe it’s for other reasons. Relationship reasons. Physical reasons. Emotional reasons. Today I offer this…. Maybe, it’s okay. Sit with it.Rest in it. Let yourself be emptied out…… don’t be afraid. It’s possible God’s about to refill you. Even here. In the empty place. The Nothing moment. Praying for you, as I heal. And got nothin. “Dear Lord…. I hate wanting to offer something and feeling like there’s nothing.I pray that you’d use this offering of nothing to help someone else thorough their season of exhausted emptying. I pray that you would be with us while we’re quietly present. While we’re surviving and doing the minimum. That when we finally reach empty…. you’d fill us anew. I love you Lord… help me to be joyful in hope, patient in affliction (Although I’d honestly rather – you just heal me…) And help me to be faithful in prayer…. for myself, my family…. and others… I love you lord and…. honestly I thank you for this time to heal.. to empty…. to be renewed. Amen. As far as my body goes— today is day 19 post surgery. I can fold a bit of laundry if someone beings it to me. I can shower and get my face together without needing a nap in between. I’m cutting back on pain meds slowly and very carefully. I’m using a lot of soft ice packs that really help. (Elasto-gel available on Amazon.com Google the neck wrap. LOVE them. I tuck one under my brace almost all day long. (I have several- always one in the freezer.) It helps with the swelling, pain and keeps the brace from irritating my incision. I’m not as sleepy as I was. Somedays I need a nap. But not everyday. I can swiffer the hardwood….. and wipe down bathroom and kitchen stuff now. It’s getting easier to reach up and wash my hair… but styling is still pretty hard. Just can’t lift my arms that high yet. (Stupid heavy duty- jet engine powered hair dryer!) I’m not able to sleep in the bed yet. But, I will try again soon. Boy.. for having nothing… I sure said a lot! A Slow Slog in the Right Direction….((((HUG)))). Been there, mucked that.